Tucson. Earth fissures continue to be a growing problem in Cochise County as new fissure areas have been identified in the past two years. Earth fissure maps for two such areas, Croton Springs, Willcox Basin, and Elfrida, Douglas Basin, are now available as free PDF downloads at the Arizona Geological Survey (AZGS) Document Repository. The Picacho-Friendly Corners area, Pinal County, and Three Sisters Buttes, Cochise County earth fissure study area maps are reissued in this new map format as well. AZGS’s Earth Fissure Viewer shows the footprints of all previously mapped fissure study areas and provides links to free, downloadable PDFs. A Geographic Information System (GIS)file showing the locations of mapped earth fissure traces in Arizona should be available for download shortly. Earth fissures are cracks, seams, or separations in the ground c differential land subsidence that accompanies extensive groundwater harvesting. The earliest appearance of fissures in Arizona was near Eloy in 1927. Individual fissures range in length from hundreds of feet to miles, and in width from inches to tens of feet. Currently, geoscientists believe that fissures initially form at the groundwater table and then propagate upwards hundreds of feet to the surface. Because fissures are commonly oriented perpendicular to local drainages, they are capable of capturing surface runoff. In-rushing waters may result in rapid erosion of sidewalls and gully development causing dramatic and sudden changes in fissure geometry -- length, depth, and width. Earth fissures are a geologic hazard in the arid valleys of central and south-central Arizona. As population centers expand into subsiding areas of basins/valleys, residents and structures are placed in closer proximity to fissures. Property owners are encouraged to 1) set structures as far away from fissures as possible, and 2) prevent water from entering fissures. Reports of earth fissures are confined to Cochise, Maricopa, Pima, and Pinal counties in central and south-central Arizona. In 2007, AZGS released 1:250,000-scale planning maps of the four counties showing the approximate locations of earlier reported earth fissures. These earth fissure planning maps are available free, online at the Earth Fissure Center at www.azgs.az.gov/efc. AZGS is charged by state statute with mapping earth fissures in Arizona. Tucson, Arizona. The National Geothermal Data System (NGDS – www.geothermaldata.org), an online network of data repositories and state geological survey providers, reached a major milestone recently with the inclusion of data from more than 1 million wells in its distributed national data system. This includes more than 717,000 oil and gas wells, 414,000 water wells, and 9,300 geothermal wells spread broadly across the nation. The data are all free for online viewing or downloading, funded by a number of grants from the US Department of Energy (US DOE). New well data are being added continuously and the NGDS is expected to serve 2 -3 million wells within another year. The wells are critical resources to aid in the exploration and development of the nation’s geothermal energy resources, but are also invaluable for a wide variety of environmental and natural resource uses. The geothermal industry identified access to reliable scientific and technical data to the US DOE as their most critical need. Each well is accompanied by geographical coordinates, county and state location, well status, total depth, and spud and end-of-drilling dates. Some wells include some or all of the following: bore hole temperature, aqueous geochemistry, drillers log, and geophysical logs – typically porosity, resistivity and temperature logs. Data quantity at NGDS is burgeoning as 100s of data providers - academic researchers, private industry, and state and federal agencies - deliver a continuous stream of fresh data, such as additional well and header data, geologic maps, geologic fault and seismic hypocenters, heat flow and thermal conductivity data, and thermal/hot springs chemistry and temperature data that are important for geothermal energy exploration and development. “The National Geothermal Data System is supplying vast amount of data to help the geothermal industry develop America’s abundant geothermal energy resources. This is part of the US DOE goal of putting America on the path to a sustainable, greener energy portfolio, and energy independence,” said Dr. Lee Allison, Director of the Arizona Geological Survey, who is leading the systems design team for the NGDS and a companion project to populate NGDS with data from all 50 states. To serve the geothermal exploration and research communities, the NDGS catalog portal provides fast and efficient data discovery via an interactive geographic map tool, ready data access, and analysis. Map services of NGDS data mashup with an array of base maps and accommodate common GIS applications, including GoogleEarth, ArcGIS Online, ArcGIS Explorer, NREL Geothermal Prospector, Microsoft Layerscape, and the USGS’ National Map Viewer, among others, assuring data consumers use of the platform of their choice for visualizing and analyzing data. NGDS uses open standards and protocols to encourage developers to build custom applications (Apps) for accessing and displaying data. For those attending the American Geophysical Union (AGU) Fall meeting in San Francisco from 3-7 December, visit the National Geothermal Data System booth (#104) on the Exhibit floor for a live demonstration of the search and access capabilities of NGDS. Background. NGDS is a network of information providers and consumers who share common standards and protocols regarding data registration, discovery and interchange. Funding for NGDS is provided by the U.S. Department of Energy’s Geothermal Technologies Program under award DE-EE0001120, DE-EE0002850, DE-EE0002851, DE-EE0002852, and an interagency agreement with the USGS. These projects are awarded to the following lead institutions: Boise State University, the Association of American State Geologists (AASG), National Renewable Energy Laboratory, Southern Methodist University, and the U.S. Geological Survey, respectively. For additional information visit the National Geothermal Data System website (geothermaldata.org) or email the Arizona Geological Survey (project managers on the State Geological Survey Contributions to the NGDS) at contact@stategeothermaldata.org. This news release is a product of the Arizona Geological Survey, project manager for AASG State Geological Survey contributions to the NGDS. Tucson. Not so long ago, mountain building was alive and well in southern Arizona. A new Arizona Geological Survey Contributed Report by Dwight Hoxie, Exhuming the Remains of the Inactive Mountain-Front Pirate Fault, Santa Catalina Mountains, Southeastern Arizona, describes the Pirate fault system of the western Santa Catalina Mountains. The fault demarcates uplift of the Santa Catalina structural block to the east, from the down-dropped, alluvial Cañada del Oro basin to the west. Vertical displacement on the nearly 16 mile long fault is about ~ 2.5 miles or 13,200 feet, which occurred over a six million year span from ~ 12 to 6 million years before the present. Once buried under detritus eroded from the uplifted Santa Catalina Mountains, the Pirate fault is currently being exhumed by the downcutting Cañada del Oro and its tributaries. “This field examination reveals the fault to have left a sparse but diverse collection of remains implying a varied history of fault development and evolution,” says Hoxie. In detailed mapping of the trace of the Pirate fault zone, he identified a number of sites of exposed fault rocks and fault-related features, ten of which he describes in detail. Key observations include identifying local, hematite-rich zones and noting the presence of small-volume, mafic dikes that intruded fault breccia near the end of active uplift on the Pirate fault. The report includes an annotated satellite image of the Santa Catalina Mountains - Cañada del Oro Basin and a suite of maps showing the distribution of geologic units – alluvium, granites (emplaced between about 70 to 26 million years before the present), and the Pinal Schist, a 1.6 billion-year-old metamorphic rock – that crop out along the fault. The author, Dwight T. Hoxie, is a geologist retired from the U.S. Geological Survey. Citation: Hoxie, D.T., 2012, Exhuming the Remains of the Inactive Mountain-Front Pirate Fault, Santa Catalina Mountains, Southeastern Arizona. Arizona Geological Survey Contributed Report CR-12-F, 18 p.
Tucson. Ranching and agriculture comprise Arizona’s second largest industry. “The diversity of Arizona agriculture’s $10.3 billion industry means we can experience all types of agriculture: farming, ranching, plant nursery, big, small, direct-market, bulk commodities, family, corporate, and more,” says Arizona Farm Bureau President and fourth-generation farmer Kevin Rogers. On November 13, the Arizona Experience website continues its celebration of Arizona’s centennial with the release of its first articles showcasing this industry. Like mining, cattle ranching brought people to Arizona. Today, cattle ranches dot every county in Arizona. Each year approximately 870,000 head of cattle are raised on 3,800 Arizona ranches. Many ranchers are third and fourth generation Arizonans. Explore how 300 years of ranching has molded today’s ranchers into land stewards. Discover how starting a moth farm has saved cotton crops or sample the breadth and diversity of Arizona’s farming and ranching products. As always, educational material is a priority. Teachers can open a lesson plan for 4th-12th grade students about local commodities approved by the Arizona Department of Education. Handy guides to seasonal produce and an interactive farmers’ market locator are resources for the classroom. These materials and more can be used in the Imagine Arizona Lesson Plan Contest, which challenges Arizona teachers to build their own lesson plan using material found anywhere on the Arizona Experience site. About Arizona Experience - The Arizona Experience commemorates 100 years of statehood and offers an online portal to the people, places, and events that defined Arizona’s past and continues to shape its future. More than a website, the Arizona Experience celebrates Arizona via unique fly-throughs of iconic landscapes, interactive maps, historic timelines, oral histories and informative articles, videos, and slide shows that will inform and enrich anyone’s Arizona experience. Tucson. Concerns about the impact of carbon dioxide from industry and energy production on climate change have spurred studies of sedimentary basins in southern Arizona for their potential as geologic repositories for this greenhouse gas. A new Arizona Geological Survey report, Geologic Evaluation of the Tucson Basin for Carbon Dioxide Sequestration Potential, evaluates the suitability of the Tucson Basin for sequestering carbon dioxide. A viable geologic repository for sequestering carbon dioxide must meet three conditions. First, it must host a substantial volume of porous and permeable rock or sediment at a depth of more than 800 meters (2,625 feet); a depth sufficient to maintain carbon dioxide in a supercritical state where it behaves more like a liquid than a gas. Second, the repository must host saline groundwater - to prevent contamination of fresh water aquifers. Third, it must be capped by a continuous impermeable layer of clay, salt or some other coherent and impermeable material, to prevent carbon dioxide from migrating surface-ward. The Tucson Basin is one of 10 Cenozoic basins in southern Arizona’s Basin and Range Province with the requisite sedimentary basin-fill volume, depth to bedrock, well control, and overall size to warrant study as a potential geologic repository for carbon dioxide. Thirty-six deep wells, out of the 7,000 wells drilled in the Tucson Basin, provide the information necessary to evaluate and characterize the composition, porosity and permeability of deep basin-fill deposits, as well as yielding crucial information on depth to bedrock. Basin-fill in the Tucson Basin is subdivided into older lower basin-fill (LBF) and younger upper-basin fill (UBF) deposits. According to Gootee, “The UBF was deposited in a closed basin during a generally tectonically quiescent period… 6 – 2 Ma ” and ranges in thickness from 330 feet to 4100 feet (Ma refers to millions of years ago). The LBF is similar in extent and thickness to UBF and was deposited under similar, although more tectonically active, conditions between 13 and 6 Ma. While clay lenses and salt layers occur in both the LBF and UBF, a continuous impermeable cap was not identified from well logs. The report includes a geologic map and multiple geologic cross-sections of the Tucson Basin that illustrate the structure of the basin and the extent of basin-fill deposits. Gootee concluded that “permeable strata below 800 m (2,625 feet) depth is sufficiently thick and potentially favorable for CO2 sequestration.” The lack of salinity data for deep aquifers, however, precludes an adequate assessment of storage volumes in saline formations below 800 m. Additionally, Gootee was unable to identify an extensive seal or capping unit near or below 800 m (2,625 feet) depth. Investigation of the Tucson Basin was supported by the Department of Energy (DOE), including its National Energy Technology Laboratory and West Coast Regional Carbon Sequestration Partnership (WESTCARB), which established national programs to evaluate the technical feasibility of long-term subsurface geologic storage of carbon dioxide produced by industrial activity. WESTCARB is a consortium of seven western U.S. States and one Canadian Province that includes Arizona and is one of seven regional North American partnerships charged with evaluating technical aspects of high-volume CO2 capture and sequestration. The Arizona Geological Survey (AZGS) began work in 2010 on WESTCARB Phase III – Arizona Geological Characterization (California Energy Commission Agreement Number 500-10-024). Citation. Gootee, B.F., 2012, Geologic Evaluation of the Tucson Basin for Carbon Dioxide Sequestration Potential. Arizona Geological Survey Open File Report, OFR-12-40, v 1.0, 11 p., 3 plates. Young faults and historical earthquakes in Arizona. Click image to enlarge. At 10:18 am on Thursday, October 18, more than 35,000 school children in hundreds of classrooms across Arizona, will drop, cover, and hold on during Arizona's first statewide Great Arizona Shakeout earthquake preparedness drill. They will be joined by thousands more in state and federal offices, tribal communities, civic groups, and businesses. Each year hundreds of earthquakes occur in Arizona. Most go unfelt, but the potential for rare, life-threatening, large magnitude earthquakes exists. Arizona’s largest earthquakes in 2011, of magnitude 3.7 and 3.6, occurred near Clarkdale in central Arizona. Faults in Arizona, surrounding states and Mexico are capable of damaging earthquakes up to magnitude 7.5 that could cause strong ground shaking across Arizona. During an earthquake the greatest immediate danger in most homes and buildings is from flying or falling items - ceiling tiles, furniture, pictures, lights, mirrors, ceiling fans, and other items. Lessons learned from the 2-minute ShakeOut “Drop, Cover and Hold On” exercise can protect you, your family or students from serious injury. ShakeOut drills inform people at school, work and home how to prepare for and survive the next damaging earthquake. "We don't often get advance notice before disaster strikes, so the opportunity for residents to drill in the Great Arizona Shakeout is invaluable," Lou Trammell, director of the Arizona Division of Emergency Management, said. "It's also a great way for parents to participate in emergency preparedness with their kids." Participating in ShakeOut is free and open to the public. You, your family, or school can take part in the Great Arizona Shakeout by enrolling online at www.shakeout.org/arizona/. Once registered, you will receive information on how to plan your drill and how to engage your community. Arizona joins California, Idaho, Nevada, Oregon, Utah and Washington in hosting ShakeOut events on October 18, 2012. In the Western U.S., more than ten million people are expected to participate this fall. 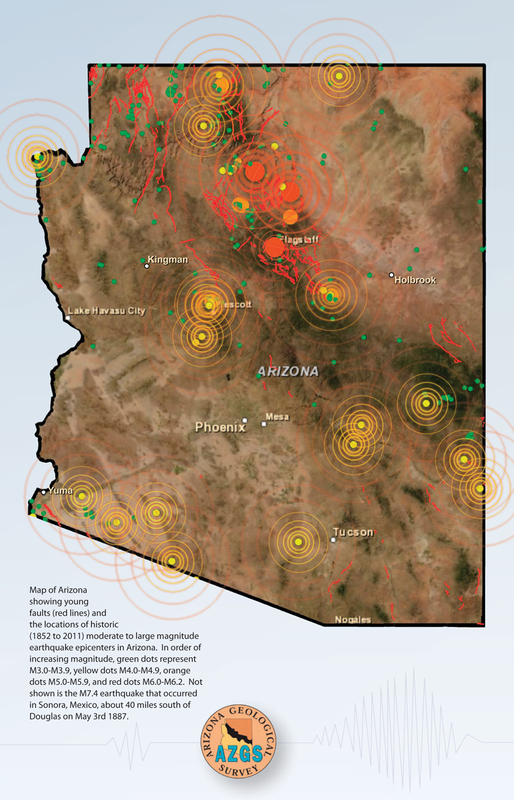 For additional information on preparing for, surviving, and recovering from an earthquake, see “Arizona is Earthquake Country,” a 44-page online publication that includes a detailed seven-step earthquake safety guide. Partners in the Great Arizona Shakeout 2012 include the Arizona Geological Survey, Arizona Division of Emergency Management, Arizona County Emergency Manager’s Offices, Arizona Emergency Information Network, Arizona Red Cross, and the Federal Emergency Management Agency. Enroll today in Arizona ShakeOut for a safer Arizona tomorrow. Extensive information is available for the public and media at http://www.shakeout.org/arizona/. AZGS YouTube channel with earthquake and fault videos, includes 90-second, time-lapse video, "Earthquakes in Arizona 1852-2011." Tucson. Arizona has earthquakes. Now with the online release of "Arizona is Earthquake Country," Arizonans have a guide on how to prepare for and minimize damage from the ground shaking that accompanies earthquakes. Each year dozens of earthquakes occur in Arizona, most go unfelt, but rare, moderate to large magnitude earthquakes can occur. This 44-page guide includes maps, pictures and diagrams illustrating where earthquakes happen, how to prepare your home or business to prevent damage, and what to do during ground shaking. "Arizona is Earthquake Country" is the 21st booklet in the Arizona Geological Survey's popular Down-to-Earth series. Young, active faults exist in and around Arizona. The northern Arizona Seismic Belt, which bisects Coconino County, hosts the greatest concentration of active faults in the state and is the most seismically active region in Arizona. Some faults, such as the Lake Mary Fault just south of Flagstaff, are capable of large magnitude earthquakes, up to magnitude 7. Yavapai, Mohave, Yuma, Pima, Cochise, Graham and Greenlee County all host faults capable of delivering moderate to large seismic events, too. And large earthquakes on faults from surrounding states and Mexico, including California's San Andreas fault system, are capable of damaging homes and infrastructure and threatening lives here in Arizona. deal with damage and related issues immediately following an earthquake. The booklet provides a primer on the nature and geology of earthquakes in Arizona, describes six prominent faults, and revisits three major historic earthquakes that impacted the state. Instructions on how to use the U.S. Geological Survey's online earthquake probability tool to establish the risk of a damaging earthquake in your community are also provided. Sections on monitoring earthquakes, earthquake resources - including online resources, and a glossary, round out the text. This earthquake preparedness guide is released just in time to complement Arizona's first-ever Great Arizona ShakeOut, a two-minute "Drop, Cover, and Hold On" earthquake drill that can minimize personal injuries and save lives. Scheduled for 10:18 a.m. on October 18th, enrollment in the ShakeOut drill is open to all, but K-12 schools are particularly encouraged to participate; for online enrollment visit the Register Here! page. To date, more than 11,500 have enrolled in ShakeOut. Citation: Arizona Geological Survey, 2012, Arizona is Earthquake Country. Down-to-Earth #21, 44 p.
Tucson. Arizona receives about 43% of its water supply from groundwater. A new statewide study documenting salinity concentrations of 270 deep groundwater wells in Arizona found that fresh water can extend as deep as 5,000 feet (1,500 m) in some areas but below 6,600 feet (2,000 m) only brackish or saline groundwater was encountered. As part of a program to examine the suitability of sedimentary basins in Arizona as potential geologic repositories for industrial carbon dioxide (CO2) injection and disposal (called "geologic sequestration"), geologists of the Arizona Geological Survey (AZGS) reviewed geophysical well logs to catalog the concentration of total dissolved solids (TDS, i.e., salinity) of 270 water wells. This included all water wells that penetrated deeper than about 2,600 feet (800 m), which is the minimum depth necessary to sequester carbon dioxide. Of the 56 wells that penetrated 2,600 feet (800 m) depth, 36 were on the Colorado Plateau and 18 were in sedimentary basins of Arizona's Basin and Range Province. Twenty-two deep wells (wells > 2,600 feet) had TDS values greater than 10,000 milligram per liter (mg/L), while 34 showed TDS concentrations less than 10,000 mg/L. The study concludes that fresh, brackish, saline, and brine water exist below 2,600 feet (800 m) depth in the Colorado Plateau and sedimentary basins. Fresh water can extend as deep as 5,000 feet (1,500 m) but below 6,600 feet (2,000 m only) brackish or saline groundwater was encountered. To further characterize salinity of Arizona's groundwater, AZGS geologists documented all shallower wells with elevated salinity values. This resulted in an additional 214 wells being analyzed: 115 wells with TDS greater than 10,000 mg/L, and 99 wells with TDS between 5,000 and 10,000 mg/L. Correlations between salinity and depth are difficult to discern regionally or even in individual basins. Brackish and saline conditions are present in both provinces below 6,500 feet (2,000 m) depth. Groundwater salinity of basins varies broadly and there is no obvious trend between basin-sediment volume and groundwater salinity. Basin groundwater is influenced by sampling methods, depth, borehole-screened intervals, drilling fluids at the time of sampling, and a variety of geologic factors (e.g. rock chemistry, faults, geothermal gradients, and salt domes). Groundwater data was provided by the US Geological Survey – National Water Information System, Arizona Dept. of Environmental Quality, Arizona Department of Water Resources - Groundwater Site Inventory, Arizona Oil and Gas Conservation Commission, and consulting geologist James Witcher's Geothermal Resource Data Base. For well reports reporting conductivity in place of TDS, a conversion factor was used to calculate the equivalent TDS value. The U.S. Department of Energy (DOE) funded this research as part of nationwide program to explore a variety of geologic repositories for their carbon dioxide sequestration potential. The report is available online for review or downloading at no cost. Citation: A Summary of Salinities in Arizona's Deep Groundwater, 2012, Gootee, B.F., Mahan, M.K and Love, D.S. Arizona Geological Survey Open-File Report, OFR-12-26. 10 p.
Tucson. Mapping of earth fissures in the Bowie San Simon area east of Willcox in Cochise County is complete and the map available online at the Arizona Geological Survey Document Repository. This is AZGS’s first earth fissure map product employing a base map of National Agriculture Imagery Program aerial photography, and the first to include land subsidence imagery from the Arizona Dept. of Water Resources. Arizona Geological Survey (AZGS) geologists mapped nearly 20 miles of continuous and discontinuous earth fissures in the Bowie San Simon area. Additionally, the map displays approximately 3.5 miles of reported but unconfirmed fissures. Earth fissures here intersect El Paso Corporation’s buried natural gas pipeline, Interstate 10, and a number of surface roads. Besides posing a threat to infrastructure, fissures are frequently used as an illegal dumping ground for tires, appliances, construction debris, manure and other sundry items. Because fissures extend downward to the water table they represent a potential conduit for surface runoff to contaminate groundwater resources. In Cochise County, the Sulphur Springs North earth fissure area, immediately north of Willcox, still remains to be mapped; maps of the Dragoon Road and Three Sisters Butte areas were published in 2009 and 2010, respectively. For interactive viewing of earth fissure maps for study areas in Cochise, Maricopa, Pima and Pinal Counties visit AZGS’ Earth Fissure Viewer. The AZGS Earth Fissure Mapping Program will continue to monitor existing earth fissures and map new ones as they form. AZGS geologists are working with hydrologists from the Arizona Dept. of Water Resources to better understand where and when fissures will appear, and with local environmental and geological engineers on ways to mitigate and minimize the impact of earth fissures. Earth fissures are cracks, seams, or separations in the ground produced during differential land subsidence that accompanies extensive groundwater harvesting. The earliest appearance of fissures in Arizona was near Eloy in 1927. Individual fissures range in length from hundreds of feet to miles, and in width from inches to tens of feet. Currently, geoscientists believe that fissures initially form at the groundwater table and then propagate upwards hundreds of feet to the surface. Because fissures are commonly oriented perpendicular to local drainages, they are capable of capturing surface runoff. In-rushing waters may result in rapid erosion of sidewalls and gully development causing dramatic and sudden changes in fissure geometry -- length, depth, and width. Reports of earth fissures are confined to Cochise, Maricopa, Pima, and Pinal counties in central and south-central Arizona. In 2007, AZGS released 1:250,000-scale planning maps of the four counties showing the approximate locations of earlier reported earth fissures. These earth fissure planning maps are available free, online at the Earth Fissure Center at www.azgs.az.gov/efc. AZGS is charged by state statute with mapping earth fissures in Arizona. On 14 March, the Virtual Arizona Experience rolls out the Arizona Mining and Mineral Resources theme showcasing the miners, mines, and minerals that shaped Arizona and formed, and continues to form, the backbone of the state economy. Experience Arizona is a dynamic, multimedia, 4D (3D plus time) web environment with interactive maps, hundreds – soon to be thousands - of images, historical timelines, flyovers of iconic landscapes, interviews with Arizona leaders, featured artists, videos - onsite and at the Arizona Experience YouTube channel, and oral histories that capture the experiences of the men and women that shaped the state. We used Microsoft Research's new Layerscape visualization software to produce the 3D flyovers, and we worked closely with software company ESRI to broadcast interactive maps that incorporate spatial data, content, interactive timelines, and photo galleries. These dynamic tools and extraordinary content are tailor made for teachers challenging their students to explore Arizona's past, examine its present, and imagine its future. Mining Arizona’s Metals – interactive map of active mines in Arizona, Morenci mine flyover, and surface and underground mining techniques slideshow. Rock Products – Building Arizona – interactive cement plant tour, map with locations and mineral commodities of more than 300 quarries or mines, videos and photo gallery. Miners Story – Video gallery of the men and women of San Manuel recounting their experiences living and working in one of Arizona’s historic mining communities. H. Mason Coggin Photo Collection – Arizona historic mines and miners photo gallery. Featured Museum Exhibit: University of Arizona Mineral Museum’s, “100 Years of Arizona’s Best: The Minerals that made the State,” which includes a virtual tour of 16 historic mining communities illustrated with images and videos. More Miners Story – Oral histories of the men and women of Arizona’s mining communities. Interview with Mila Lira of the Arizona’s Copper Corridor Economic Development Coalition. Future of Arizona Mining – an interview with Dr. Mary Poulton, Chair, University of Arizona Mining & Geological Engineering Dept. On Statehood Day, 14 February 2012, Governor Brewer rolled out the Arizona Experience with its Arizona Lands and Celebrates themes. Over the next year, we'll release a new theme each month. Conceived to commemorate one hundred years of statehood, the Arizona Experience celebrates where Arizona has come from and where it is going.